We repair all air conditioner makes and models, even if we didn’t perform the initial installation. We train our technicians to keep up with the latest technology in our industry so as to ensure that we get the job done right the first time. When we are done, we will test the system to ensure optimal performance and efficiency. We do not start any repairs unless the customer approves them. Our technicians will give you a couple of options for service – so whether your job is small, medium, or large, you’ll have a full understanding of our work the whole time, with no miscommunications or surprises along the way. 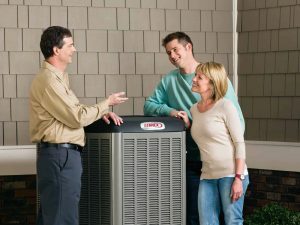 What is the life expectancy of an AC unit? In general, an air conditioning unit lasts between 10 to 15 years, although with maintenance, units can last as long as 20 years. If your unit is near the end of it’s life and having more problems, buying a new one may cost you less over the long term than continuing to fix everything that goes wrong with it. How often should your unit receive maintenance? In many cases, as long as an air conditioner isn’t having any obvious problems, it’s easy to forget that it needs to be maintained. Unfortunately, poor maintenance can significantly decrease the life of your unit and will even make it less effective. We recommend having your air conditioner serviced at least once per year. This involves turning up the unit, inspecting it for developing problems, and clearing it of dust and debris. This routine maintenance is crucial to the longevity and efficiency of the unit.